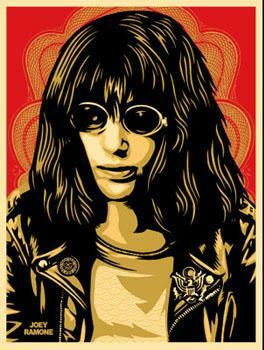 This print was commissioned by Joey Ramone's Mother and Brother to help raise awareness and funds to support the Joey Ramone Lymphoma Research Foundation. In part, 100 of the 300 Limited Edition prints, as well as an Original Joey Ramone Hand Collage Stencil, were donated to the Lymphoma Research Foundation. The artwork was sold and auctioned at this years Joey Ramone B-Day Bash. For more information about the Lymphoma Research Foundation and what you can do to help, please visit www.joeyramone.com and www.lymphoma.org.